installation or maintenance access is in a physically demanding or hazardous area. application requires fire detection within close proximity. harsh conditions may not allow for other methods of fire detection. Linear heat detection cables combine advanced polymer and digital technologies that can detect heat conditions anywhere along the length of the cable. The cable is comprised of two zinc-coated spring steel conductors, individually coated with a heat-sensitive thermoplastic polymer engineered to melt at fixed temperatures. Once the polymer melts, the conductors initiate contact with one another and communicate with the control panel to sound alarms or activate suppressing systems. 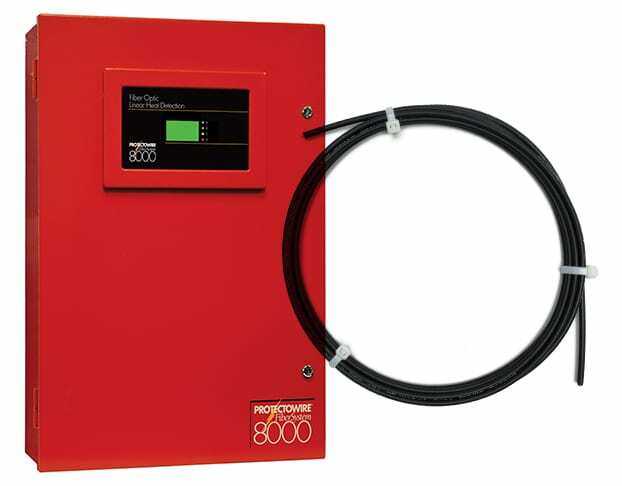 For comprehensive visibility, linear heat cables may be coupled with Protectowire PIM-530 and CTM-530 modules that supervise specific zones, identifying the precise location and temperature of the activation. These modules interface seamlessly with Fike control panels. Within standard linear heat cables, alarms are activated when the two conductors touch, causing a short. This includes accidental activation, such as if a forklift damages an LHS cable and the two conductors make contact. Confirmed Temperature Initiation (CTI) technology by Protectowire protects against accidental alarms and discharge. When coupled with a CTM-530 control module, CTI linear heat detectors greatly reduce false alarms by confirming the temperature where the conductors were activated. If the temperature is normal, the CTM-530 will not trigger an alarm status but rather the “short fault” status, indicating mechanical activation or damage of the conductors, but no confirmation of alarm without exposure to heat that is above the specified threshold. EPC & CTI (Polyvinyl Chloride) – Ideal for general, multi-purpose applications. Type XCR & CTI-X (Fluoropolymer) – Ideal for extreme environments and includes excellent resistance to chemicals and UV. Type XLT (Proprietary Polymer) – Ideal for low temperature environmental performance such as cold storage; only digital linear heat detector rated at 135°F alarm temperature. Type PLR (Polypropylene Elastomer) – Ideal for applications located outside and requiring long runs of cable. Fiber optic cables represent the future of linear heat detection—and it’s available now. Best described as a continuous linear thermometer that actively reports temperature readings, fiber optic linear heat detection is immune to EMI and RFI and can be configured to offer programmable alarm criteria along the length of the cable. Furthermore, because fiber optic linear heat detection is not activated by melting polymer, fiber optic cables are restorable up to 235°F.